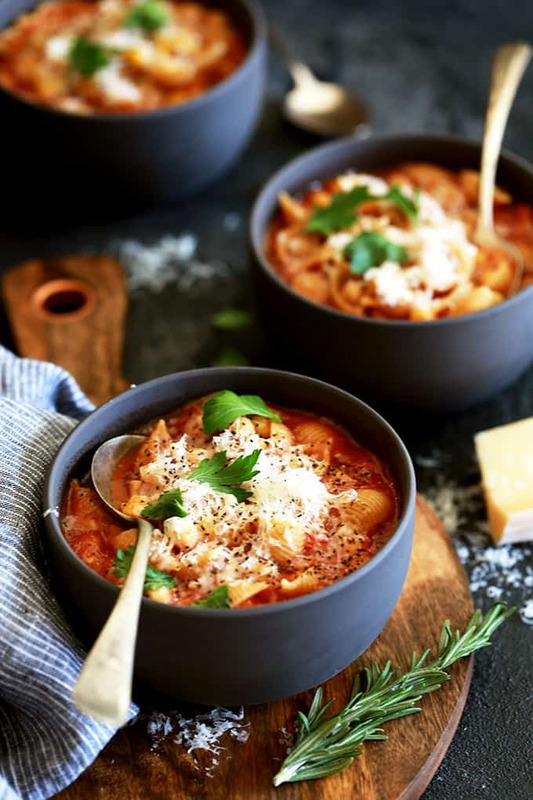 This Chickpea and Pasta Soup is the reason you’ll never buy a can of chickpeas again. The heavy handed shower of Parmesan and chopped fresh parsley that top each bowl really seal the deal on this becoming your new favorite soup. Original content posted January 2018. Updated January 2019. This is it. 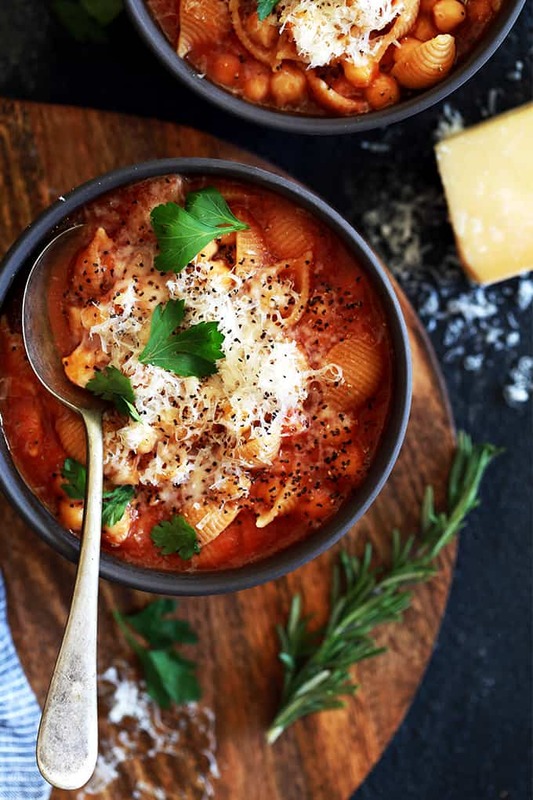 This Chickpea and Pasta Soup is the reason you’ll never buy a can of chickpeas again. I promise. It’s not hard. It’s not labor intensive. Instead, it’s the most soul satisfying experience to serve your family a warm and comforting bowl of soup with the best of the best ingredients. Including the most melt in your mouth chickpeas that are so many steps above the canned variety, you’ll wonder why you ever took that shortcut. 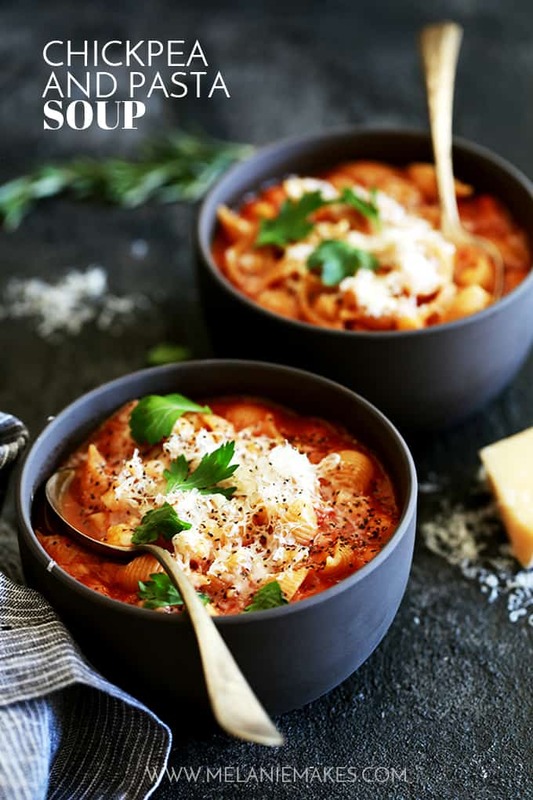 This Chickpea and Pasta Soup recipe is one of those that takes some time to prepare, but it’s nearly all hands off time. So hands off that the chickpeas soaked overnight while I slept and then as they were simmering away I rode my spin bike, took a shower and fed my two year old lunch. This is a recipe that works for you and not the other way around. As all recipes should! In other words, do not be afraid of cooking with dried beans if you normally go the canned route. I promise the end result is so worth it! How Long Do You Cook Dried Chickpeas? For those of you keeping score, you simply soak dried chickpeas overnight and then simmer them with two of my favorite flavors, rosemary and garlic, in chicken broth for a couple of hours. Easy enough, right? Soon enough you’re ready to serve up some steaming bowls of deliciousness topped with a heavy handed shower of grated Parmesan cheese, some cracked blacked pepper and some freshly chopped parsley. So good. SO. SO. GOOD. Please note, this recipe makes a LOT of soup. As in it filled my nine quart stockpot. To me this is a very good thing, although feel free to halve the recipe if necessary. I made this Chickpea and Pasta Soup on a Monday afternoon and then our family of six enjoyed it for dinner and several lunches, including packed into our trusty hot and cold containers for school lunches. I have no doubt my menagerie enjoys the best school lunches. I’m only jealous that I can’t just open a container and have steaming soup at the ready. And packed with love, no doubt. These are the same children that also enjoy leftovers of my Lemon Dill Chicken Noodle Soup, Easy Chicken and Dumpling Soup and Cherry Tomato and Tortellini Soup in those same lunchbox containers. In a nine quart or larger stockpot, add dried chickpeas. Cover chickpeas with water. . TIP: Add enough water so that it covers chickpeas by about 3″. In a small bowl, add baking soda, salt and flour. Add 1/4 cup water and stir together to make a paste. Drizzle baking soda paste into chickpeas. TIP: The baking soda paste helps to soften the dried chickpeas as they soak. Don’t skip this step! Stir to combine and cover chickpeas and allow to soak for 8 hours or overnight. Drain chickpeas and rinse well. TIP: To avoid an overly salty soup, insure that chickpeas are rinsed well to remove all of the baking soda paste. Return drained chickpeas to stockpot. Peel and smash garlic cloves with the side of a large knife. Add garlic and rosemary sprigs into a piece of cheesecloth. Tie cheesecloth closed to create a bundle with the garlic and rosemary inside. TIP: Kitchen twine makes tying the cheesecloth together super easy! Add cheesecloth bundle, olive oil and chicken broth to stockpot and cover. Uncover stockpot and remove cheesecloth bundle and discard. Add crushed tomatoes to stockpot. Stir crushed tomatoes into chickpea mixture. Bring chickpea mixture to a boil and add pasta. Cook until just al dente. 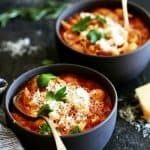 TIP: I like to use whole wheat or whole grain pasta in hearty soups like this one as extra insurance that I won’t end up with mushy pasta. 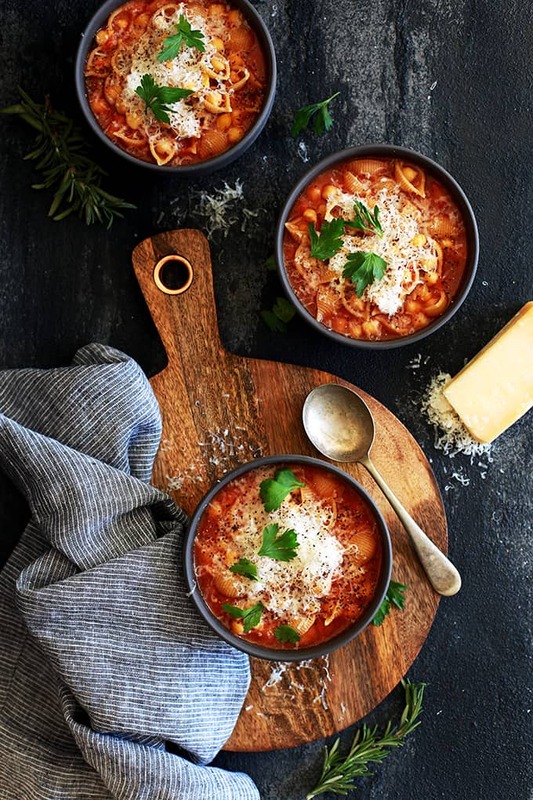 If you’ve tried this Chickpea and Pasta Soup or any other recipe on Melanie Makes, please let me know your thoughts in the comments below. I love hearing from you and respond to each and every comment! 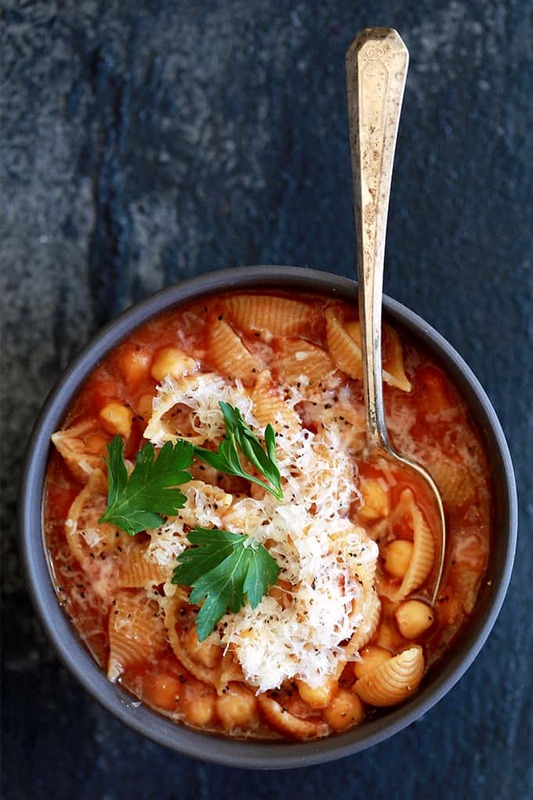 This Chickpea and Pasta Soup is the reason you'll never buy a can of chickpeas again. The heavy handed shower of Parmesan and chopped fresh parsley that top each bowl really seal the deal on this becoming your new favorite soup. In a nine quart or larger stockpot, add chickpeas and cover with water. In a small bowl, stir together baking soda, salt and flour with 1/4 cup water to make a paste. Drizzle paste into chickpeas and stir to combine. Cover chickpeas and allow to soak for 8 hours or overnight. Drain chickpeas and rinse well. Return to stockpot. Add garlic and rosemary sprigs into a piece of cheesecloth and tie closed. Place stockpot over high heat and bring to a boil. Once you hear that liquid is boiling, reduce heat to lowest setting and allow to cook for two hours. Add crushed tomatoes to stockpot and stir to combine. Serve soup topped with grated Parmesan cheese, freshly ground pepper and chopped fresh parsley, if desired. Chickpeas help pack a meatless protein punch, which makes them such a versatile pantry staple! You’ll want to keep them on hand to also make this Everyday Chickpea Curry, Mediterranean Salad with Roasted Chickpeas and Chickpea Gyro Lunch Boxes. This recipe looks lovely, and will make me buy my first dried chickpeas. Question - if I do all the work of soaking/boiling/prep, can I then make a big batch of chickpeas and freeze some for later use? Or is that not a good idea, for texture, or whatever? I'm innately lazy...um...I mean...efficient, so figured I'd ask before I ruined food. thanks! Hey, Lori - I haven't tried doing this before, but I'm sure it can be done! 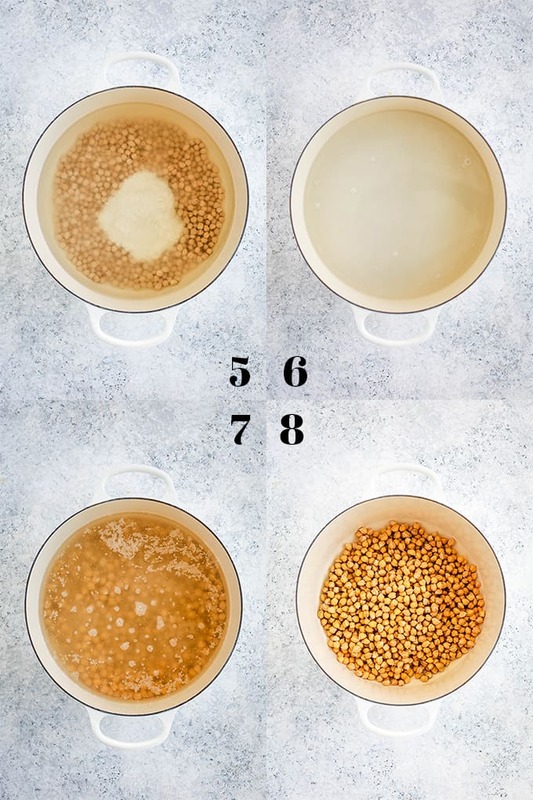 You'll just want to make sure that your chickpeas are a little on the firmer side before freezing so they aren't mushy when you make your soup. I’ve soaked many beans in my life but never heard of soaking with flour in the water. What is the purpose of this since it is rinsed off later? 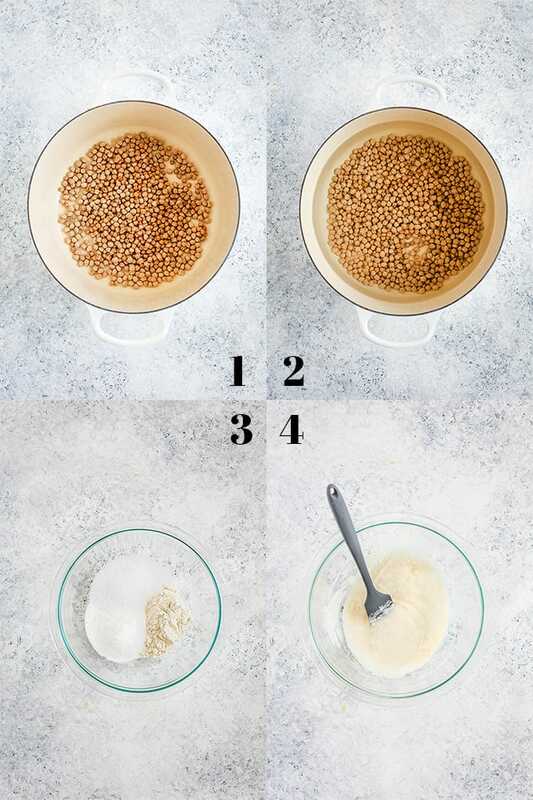 Hi, Arlinda - The flour slurry helps to soften the chickpeas while they're soaking. Hope that helps! So the chickpeas aren't soaking in cups of water? Just water enough for a slurry? This looks so delicious and super comforting! Looks so good not to try! This looks really comforting! I would love to try this for dinner tonight! Thanks so much, Erin - it's definitely a new favorite at our house! This the kind soup that all my family will love! I'm sure they would, Catalina! Has anyone notice the ridiculous amount of sodium in this recipe? Nearly 4,000 mg per serving is crazy! Is it because of the 3 T of salt in the soak (even though you rinse after soaking)? Hi, Sandra - You're exactly right! The salt is used to help soften the dried chickpeas during the soaking process and then is washed away when they are rinsed before cooking. So the sodium calculation is incorrect - it's simply being calculated because it's used in the recipe. Hope that helps! Thanks so much for clarifying! The recipient sounds good, but I was afraid to try. Now, I’m making it for supper tonight! You bet! Can't wai tot hear what you think! Thanks so much, Jacque - it's definitely become a fast favorite at our house! Yay to using real dried chickpeas!! Such an inexpensive protein without the chemicals from cans. 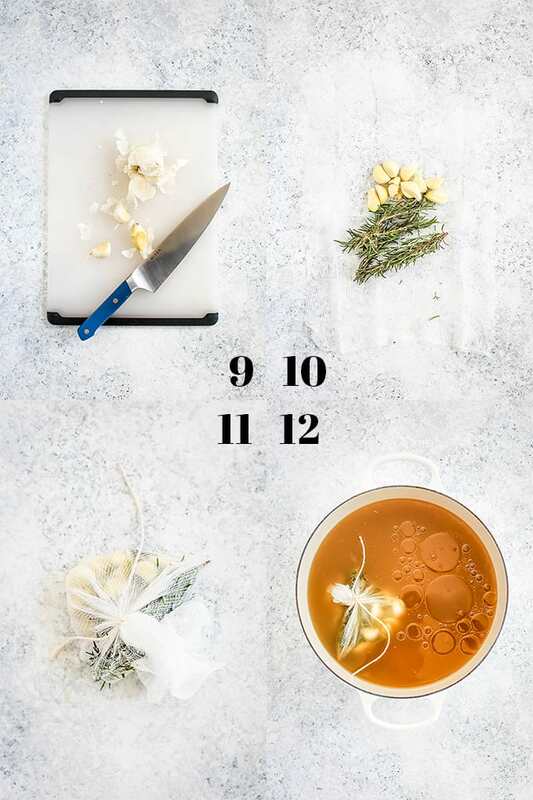 Can't wait to try this soup! 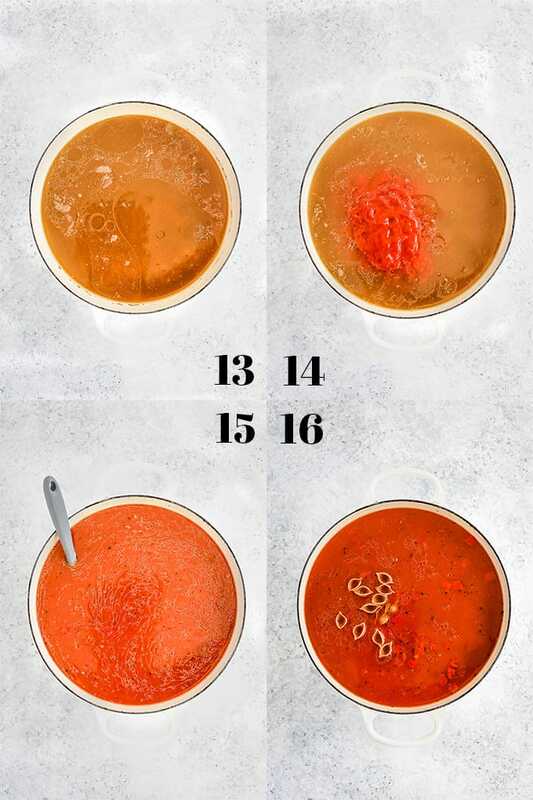 This looks like such a delicious soup! Such a great idea to use chickpeas for it! I bet the flavor in this is amazing! I'm excited to try it! It really is! Thanks, Jen! I've never tried soaking chickpeas for a soup! Oh yum! genius! 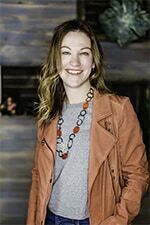 You'd love this one, Lindsay!